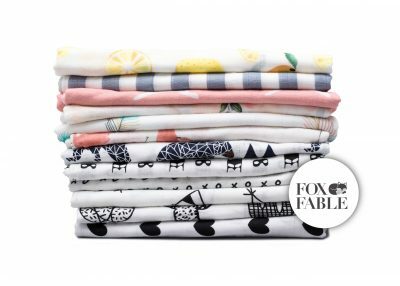 PRETORIA, 30 November 2017 - With it’s brand new range of beautiful designs, Fox Fable is filling a gap in the baby fashion and gifting market with their luxurious swaddling muslins, and blankets. The range is available through the brand’s own website at www.foxfable.co.za, or at select retailers throughout the country. “The wonders of muslin is incomparable to alternative wraps for babies - with it’s super soft, breathable texture it is perfect for even the most delicate preemie’s underdeveloped skin. With this range of designs - from bold, brights, to soft pastels - baby can now be as fashionable as mommy.” says Angelique du Toit, founder and owner of Fox Fable. Made from 100% cotton, or 70/30 bamboo/cotton mix for ultimate plushness, each item is packaged in a keepsake metal tin - creating a wonderful and easy gifting collection, and memorable unboxing experience for the mum-to-be. Founded in Pretoria in 2017, Fox Fable brings a collection of quality newborn baby products to the fashion-forward mother, using only the highest quality 100% cottons, and bamboo & cotton blends. Visit foxfable.co.za, or connect with Facebook/foxfablebaby CLICK HERE to submit your press release to MyPR.co.za. . . .
News about the restart of the construction of Acornhoek Mall has spread like wildfire throughout the Acornhoek and surrounding communities, bringing a wave of anticipation and excitement amongst residents throughout the region. 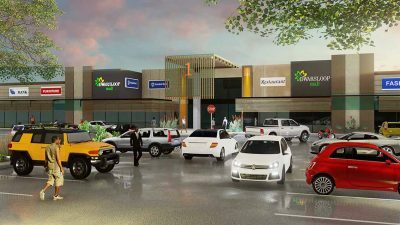 Acornhoek Mall will offer an estimated 40 000m² of retail, making it the largest enclosed mall in the surrounding area and finally fulfilling the long-awaited role of regional mall to the greater Acornhoek / Bushbuckridge area. Following a lengthy court battle spanning more than three years, the case which delayed New Africa Developments (NAD) from constructing the prestigious Acornhoek Mall has been decisively won by NAD with costs, putting this totally unjustified court case to bed once and for all. The case having been brought by Acornhoek Plaza Share Block (Pty) Ltd of which Sanlam and the McCormick’s are shareholders. NAD CEO, Japie van Niekerk's flame burns brighter than ever before: “We are working with great force and extreme energy to make up for lost time. 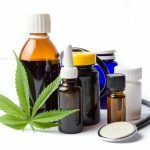 We have left the negativity behind and are moving forward with this much anticipated and highly sought after development. Not only is NAD developing a shopping mall, but will in fact be creating an exciting new development node for Acornhoek that will ultimately boast a private hospital, private school and quality middle income housing.” Van Niekerk continues: “The people of Bushbuckridge and Acornhoek in particular were denied development, local economic upliftment and job opportunities for more than 3 years which had dire consequences for this community. The project commencement can simply not come soon enough.” The site has already been handed over to the main contractor, who will use the rest of 2017 to complete groundworks and prepare the site for construction of the actual mall structure at the start of 2018. The mall will be enclosed and air-conditioned, which is a significant advantage over other retail offerings in the region as these are open to the elements. . . .
Japie van Niekerk, a well-known White River resident and philanthropist, has long advocated the benefits of playing sport as a means of developing the youth of South Africa and continues to invest in this passion. “Being a keen sportsman myself as well as a parent, I understand the vital role that sport can play in a child’s development and realise the importance of adequate sporting facilities which permit a child’s talents to be cultivated properly,” said the CEO of New Africa Developments, a property development company. Having previously assisted with a multitude of sports sponsorships and donations, including investing in the Nelspruit-based, professional NAD mountain bike team, Van Niekerk has turned his attention to Uplands College where his son is a grade 4 scholar. “After much deliberation, I eventually chose hockey as the sport at Uplands College which would benefit most from improved facilities,” said Van Niekerk, who added: “Hockey is one of the few sports where boys and girls of all ages can benefit equally from an investment of this nature.” Having previously assisted with the provision of a specialised irrigation system for the College’s new AstroTurf hockey fields, this time Van Niekerk is providing state-of-the-art floodlighting that will permit training and matches to be played after dark, thereby maximizing the large investment in the AstroTurf fields. “The floodlights will make a big difference by allowing us to offer a complete coaching programme, including the ability to upskill more children and to attract more of them to play hockey and to participate in school sport in general,” commented Alex Gitlin, the deputy head of Uplands College and passionate hockey enthusiast. 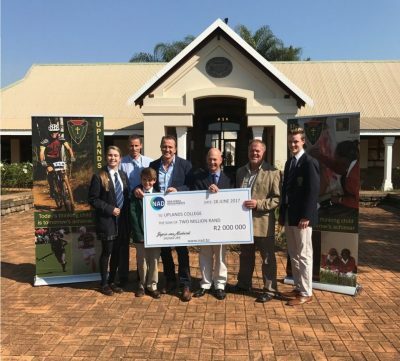 Van Niekerk hopes to further raise the profile of hockey in Mpumalanga, with his company’s contribution of R2-million towards the upliftment of this sport at Uplands College, and is hopeful that this investment will ultimately see some of the beneficiaries . . .
Change comes in many forms. New Africa Developments’ construction of an A-grade, 35,000m2 regional mall in Dwarsloop (north-east Mpumalanga) will see 33,000* households comprising more than 100,000 people from the Dwarsloop community live closer to a contemporary shopping destination than ever before. With the first phase of some 25,000m2 scheduled to open in October of this year, a radical change to the region’s shopping patterns is imminent. 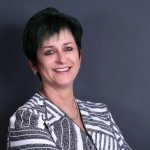 New Africa Developments’ CEO Japie van Niekerk passion for the project is infectious: “This development will drastically change the shopping behaviour of the Dwarsloop community and its surrounds. The market is severely underserviced, and this brand-new mall will fill the daily shopping needs of the bulk of the surrounding residents, for whom the closest alternative is more than 6km away and inconveniently situated atop a mountain." Van Niekerk continues: “The perception that the mall will only be serviced by the neighbouring communities and not impact the broader region is grossly inaccurate, as the substantial Dwarsloop community of more than 100,000 people is presently serviced by the limited Bushbuckridge retail offering, and thus the Dwarsloop Mall will have a substantial impact on shopping behaviour throughout the region.” Situated on the arterial R40 between Hazyview and Hoedspruit at the major Thulamahashe intersection, this green fields development is very prominent and has good access for the approximately 400,000* residents of Acornhoek, Dwarsloop and Bushbuckridge, in addition to a large percentage of Thulamahashe locals. Dwarsloop Mall will boast more than 50 stores, anchored by Shoprite & Spar together with a selection of national fashion retailers and restaurants. Committed tenants include Mr Price, Markham, Total Sports, Ackermans, Clicks, Sportscene, Roman’s Pizza, Debonairs, Exact, Cross Trainer and many more. The much anticipated R40 ring-road has been budgeted for by the local government in the . . .
With an A-grade, 35,000m2 shopping mall being constructed by New Africa Developments in northeastern Mpumalanga, this festive season will see 33,000* households closer to a contemporary shopping destination. Dwarsloop Mall boasts more than 50 stores, anchored by Shoprite & Spar major grocery tenants and includes a selection of national fashion retailers, restaurants and banks. Committed tenants include Pep, Total Sports, Ackermans, Clicks, Sportscene, Markham, Roman’s Pizza, Exact, Cross Trainer and many more. Situated on the arterial R40 between Hazyview and Hoedspruit at the major Thulamahashe intersection, this green fields development is very prominent and has good access for the approximately 150,000* residents of Dwarsloop and Bushbuckridge, in addition to a large percentage of Thulamahashe locals. The R40 ring-road has been budgeted for by the local government in the 2017/2018 financial year, and by effectively bypassing Bushbuckridge will greatly reduce the notorious Bushbuckridge traffic congestion and stimulate tourism in the Lowveld. This will ensure Dwarsloop as the main thoroughfare between Hazyview and Acornhoek, further increasing visibility and shopper convenience. New Africa Developments’ CEO Japie van Niekerk: “This development will act as catalyst for the community, bringing shopping closer than it has ever been”. With the densely-populated surrounds, this market is severely underserviced, and this brand new mall will fill the daily shopping needs of the bulk of surrounding residents, for whom the closest alternative is 6km+ away, situated atop a mountain. Van Niekerk continues: “We’re employing award-winning architects, engineers and service providers to ensure a modern, state-of-the-art centre providing a city-like shopping experience for the local community.” Additional to Dwarsloop Mall, other major investments are planned in and around Dwarsloop, making it the key development node in the region. The 560-bed Mabuleng . . .